Denver is an fascinating city. They have several miles of paved greenway trails following rivers and canals, and which are heavily used by pedestrians, joggers, bicyclists, families, roller skaters, rollerbladers, etc. As usual, everyone is smiling. This despite the unseasonably cold weather: Highs in the 50s and lows in the 40s. Quite a change from the muggy 90-degree weather I am familiar with in Florida. I see thousands of old homes, new homes, low-income homes, wealthy homes, apartments, and commercial development along the greenways, which dispels the myth I keep hearing from the greenway opponents in Gainesville that greenways won't work here because of the nearness to homes. Several homes seem to like Denver's greenways so much that they build walkways leading to the trail (in Gainesville, they talk about barbed wire and police protection). Denver is also doing tremendous work to help pedestrians. They have constructed state-of-the-art sidewalks, medians, crosswalks, bridges, downtown pedestrian malls, etc. I am extremely impressed-especially in comparison to Florida cities, where we merely pay lip service to pedestrian needs, and leave pedestrians with a miserable, dangerous walking environment. Part of the situation in Denver, though, is that the auto traffic there is very congested, and they are apparently trying everything they can to ease up on the horrible problems that all the traffic creates. I'm sure we'll be doing the same things here in Florida once the inevitable congestion arrives here. Denver has very nice restaurants, although I don't find one in either Denver or Boulder that sells the infamous Rocky Mountain oysters. One place puts out white paper tablecloths, and gives you crayons that you can use to doodle and write messages on the cloth. (you can then take it home as a souvenir). I write on mine that Gainesville needs a crayon restaurant. There were several bookstores in both cities. 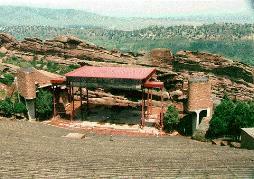 The major sights I see (other than the impressive greenways) are the state capitol, Red Rocks amphitheatre (a concert arena set within a red sandstone canyon, as shown in the photo), a tour of the U.S. mint, the 16th Street pedestrian/transit mall, and the historic Larimer Square. The City was founded in 1858 by mostly unsuccessful gold miners. It was incorporated in 1860. The railroad reached town in 1870. Soon after, silver was discovered. The population boomed and Denver became the commercial and industrial center of the Rocky Mountains. By 1910, the City had become known as the Mile-High City. The 13th step of the State Capitol, in fact, is exactly one mile above sea level. The City has many high-technology electronics companies. The population is highly educated, ranking only behind Washington, D.C. in the number of college graduates per capita. Approximately 467,610 people lived in Denver in 1990. It is considered the hub of energy research (over 1,300 such companies had relocated to the city in the 70s and 80s), and many come for the healthy, dry and invigorating climate. Have an unfortunate welcoming experience in Boulder on the morning of Day 3. Five minutes after leaving my car to explore downtown, I realize I have locked the keys in the car. It ends up costing me 2 hours and $20. The downtown Pearl Street Mall is everything it is touted to be. Very vibrant, festive, frequented by street performers, nicely landscaped, full of interesting people, and containing a wide selection of outdoor cafes, restaurants, shops, and offices. All in all, a very pleasant part of downtown, which is very unusual since most downtowns these days are becoming ugly, dangerous, vacant wastelands due to all the businesses, malls, and people moving out to the suburbs. Boulder has largely prevented this sprawl because of such things as Pearl Street, the large amounts of greenbelt parks they've bought to ring the city, and the mountains to the west, which are protected from significant development. Most of the people seem very athletic, laid back, and outdoors-oriented. When driving into the city, it seems like almost half of the cars had bicycles on them. The city seems to be mostly a middle- and upper-middle class white enclave with lots of yuppies. This is largely due to the large amount of high-tech industry, the university, and the high cost of living. I am told by a resident that poverty and crime are almost non-existent. Like Denver, Boulder has done many things to help pedestrians and bicyclists, such as closing off certain streets (and creating little parks where the street used to be), providing bike racks, sponsoring a bike-to-work week each year (those that do it get a free breakfast, and companies compete to see who can get 100 percent participation), developing a fabulous greenway system used by all those trail user groups I mentioned above for Denver, streets with bike lanes, streets narrowed to allow on-street parking and help pedestrians cross at intersections, and doing nice things with their sidewalks and crosswalks. Boulder has several enjoyable nightclubs. My favorite (Walnut Brewery) features a live jazz band each night, and several varieties of excellent beers brewed on-site. Boulder's downtown greenway is heavily used. It follows Boulder Creek, which is used by kayakers and waders. There are funny little prairie dogs poking their heads out of holes along the way. The trail extends from one end of town to the other, and passes through the heart of the city. At one end, there is a xeriscape exhibit that shows residents how to landscape their yards to minimize maintenance, fertilizer, water, and pesticide use. Like Denver, the trail passes very close to several homes, and everyone is smiling. The climate is relatively dry due to the "rain shadow" from the Rocky Mountains which loom very dramatically along the western edge of the city. Summers feature warm days, and pleasantly cool nights. The city gets a lot of sunshine, and the snow in the winter usually melts by mid-afternoon. The big weather nuisance appears to be the coldness of the winter. I notice that several homes in the area have generous amounts of south-facing windows to capture as much winter sunshine as possible. The city has an attractive historic district with many beautiful old homes. I spot a bed-and-breakfast that I'll perhaps stay at for future vacations. The drive up into the Rockies from the city is about 1/2 hour long on a steep, winding road. There, at the ski resort area, I stay in the quaint little town of Nederland. Eat at a very unpretentious and inexpensive Italian restaurant. Bring a doggie bag. They give you lots of great food. 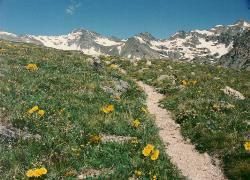 Indian Peaks was added to the National Wilderness Preservation System by Congress in 1978. The area's name was selected because many of the peaks within the wilderness are named for Indian tribes in the West. The 73,391 acre Wilderness, one of the most heavily visited wilderness areas in the U.S., is located primarily within the Arapaho and Roosevelt National Forests. The northernmost portion is located in Rocky Mountain National Park. 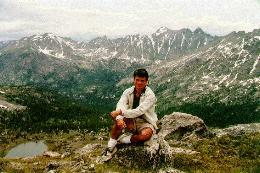 Indian Peaks contains vast areas of alpine tundra, numerous cirque basins with remnant glaciers, and nearly 50 lakes in the shadows of the Continental Divide (the photo at left shows me resting at the Divide during a hike in Indian Peaks). Elevations range from 8,400 to 13,500 feet. Wildlife includes elk, mule deer, black bear, mountain lion, and coyote. The Golden eagle, bobcat, white-tailed ptarmigan, and the snowshoe hare also are found here. Cutthroat, rainbow, brook, and brown trout are found in the streams. In the Indian Peaks Wilderness, I hike on the Fourth of July Trail (over 11,000 feet in elevation and a simply spectacular trail), the Hessie Trail (ranges from 9,000 to 11,000 feet) and Devil's Thumb (perfect for freethinkers, also ranging from 9,000 to 11,000 feet), and the Glacier Rim Trail (see photo below for Glacier Rim Trail, which ranges from 10,000 to 12,000 feet in elevation). Each trail is better, by far, than any other trail I have ever been on. The views of valleys and mountains and forests are fabulous. Roaring creeks and waterfalls. Remoteness away from other people provided excellent camp sites. Vividly colorful wildflower prairies. Hiking across snowfields, tundra, snowdrifts, and glaciers above the tree line. (When we hike the Fourth of July Trail, we ascend all the way to the continental divide-a 1 & 1/2 hour hike each way and at an altitude of about 12,000 feet. Spectacular. We see animals such as maromets and picas, huge waterfalls and glaciers, and glacier lakes. We ended up having to hurry back down because its dangerous being above the tree line when a storm rolls in. (We quickly scramble under trees to escape lightning, hail, wind, and rain.) On Glacier Rim, I see the glacier and reservoir that provides Boulder with its water (they are apparently the only city in the world that gets its water from such a source). The Trail follows the edge of the city watershed. I have spectacular views of Silver Lake, Goose Lake, Green Lake, and Arapaho Lake along the way. The drive to Glacier Rim was a challenge (as were drives to other trails) because of all the boulders and creeks you have to drive through. 15 miles per hour is the maximum speed to avoid severe boulder damage to the car-fortunately I have a rental car. It takes a long time to travel the 5 miles to Glacier Rim at 15 mph. Also have a friend take me on the Switzerland Trail, which was originally a goldmining railroad (goldmines are everywhere), then a tourist route near the turn of the century-the beautiful views of the mountains gave it the name, apparently. Now its a mountain bike trail. It involves a continuous 45-minute bicycle climb to get to the top (my previous maximum climb was 5 or 10 minutes, and on this particular day it is at high altitude with little oxygen). Nevertheless, the views make it worth it, as does the exhilarating downhill ride, at high speed, on the way back down. One of the roads into the mountains from Boulder is the Left Hand Canyon Road, which follows a creek. Along the creek are several camp sites that allow one to just pull over and camp without a fee. This I do one night. It is very handy. Summary of my impressions of the Boulder area: I have discovered paradise. I would like, at a minimum, to vacation in the Boulder area several times in the future. At that time, however, I also decide that I'm on a five-year plan. Within 5 years, I want to be living in Boulder. I'd like to spend the rest of my life here. I've tried to avoid the "grass-is-always-greener" syndrome, but it is just too wonderful to avoid moving there. It has all the advantages of Gainesville: small city, diverse culture, progressive politics, nice weather, beautiful scenery, intelligent population, large university. But it has more, like doing more for bikes and pedestrians, a better downtown, drier climate, more of an outdoorsy population, and better greenways (although I might be able to change that before I leave Gainesville).